Please note this is a region B Blu-ray and will require a region B or region free Blu-ray player in order to play.Sci-fi feature written and directed by Christopher Nolan, director of 'The Dark Knight' trilogy. On a resource-depleted Earth in the near future, the discovery of a wormhole which can transport users through time and space unites scientists and explorers in the most important mission in human history. 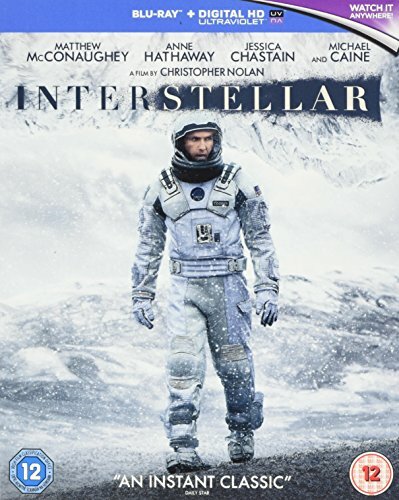 Among the potential travellers is a widowed engineer (Matthew McConaughey) who must decide whether to remain with his two children or to test the limits of human space travel, to see if there is a future for humanity out among the stars or whether the end of the Earth spells the end for humanity. Academy Award-winner Hans Zimmer returns to partner Nolan and score the film. The cast members include Jessica Chastain, Michael Caine and Anne Hathaway. The film was nominated for five Academy Awards and won for Best Visual Effects.